Much of my middle-grade children’s novel, A Boy Called Mouse, is set in the world of the late Victorian theatre. My reading and researching was inspired by three overlapping interests: the working conditions of the theatre children before Fawcett and others campaigned for their safety and education; the role of the actor-managers like Irving who made theatre-going respectable for the middle-classes, and the use of Shakespeare as a vehicle for spectacle and dramatic effects. I’d like to pretend that this work was seriously-organised study but now suspect that much of the reading was random, seeing-where-it-led pursuit with my main worry being “getting the whole thing written”, a state I’m very much in at the moment. However, my searches introduced me to a particularly beautiful garment: the dress worn by the actress Ellen Terry when she played opposite Sir Henry Irving in his 1888 production of Macbeth. Descriptions of this or that famous actor’s costumes or props, and the cost, had long been an important part of the publicity for the production, drawing in an audience as keen to see the dresses as to see the play. 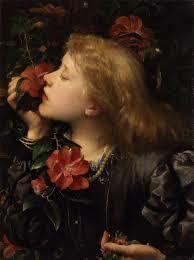 This was true of Ellen Terry’s dress. 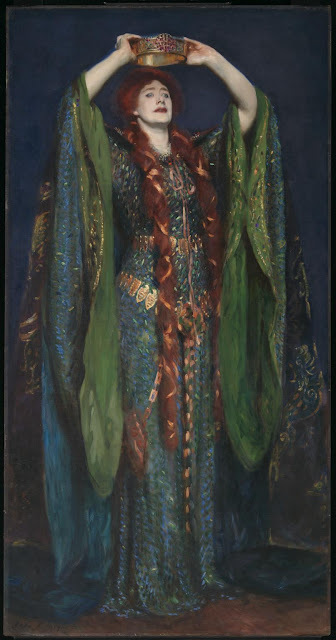 Styled like a medieval robe, it created the most spectacular sensation: this Lady Macbeth was not dressed in sultry black silk or blood red velvet but in a gown of glittering emerald-green, an effect created by the hundreds of beetle-wings stitched to the background fabric, creating a stunningly jewelled contrast to Ellen Terry’s clouds of red-gold hair. Glamorous the dress might be, but the “easy” costume had to deal with a long hard-working life, facing many hasty and less-than-careful backstage changes. Not only did Irving’s 1888 production of Macbeth run for six months, but the beetle-wing dress went travelling for tours and productions, both in Britain and across to North America. Ellen Terry appeared in this most favourite costume personally and when John Singer Sargent painted her iconic portrait, he chose to show her wearing her famous green dress. He posed her with arms upraised, drawing attention to the long folds of the sleeves, suggesting the robe of a medieval knight. Despite the painted stance, Terry never appeared in such a pose on stage during Irving’s “Macbeth”. Newspaper men in crumpled tweed jackets visited the Albion Theatre. Supping ale and oysters, they scribbled down Adnam’s description of the forthcoming play. The ladies magazines published illustrations of Bellina Lander as Titania, trailing the iridescent cloak of peacock feathers she would wear on stage, a garment that had cost over a thousand guineas without its silk lining. Just seeing that cloak, in all its coloured glory, would be well worth the price of a good seat. The opening night had sold out already. "Now the hungry lion roars!" Puck began "and the wolf be-howls the moon." Adnam and Bellina entered for their final speeches. The peacock cloak swirled out under the lights, and Adnam's deep and wondrous tones resounded magnificently. Looking back through the pages of A Boy Called Mouse, I am now surprised how briefly Terry’s faux dress appears, given how largely the real dress still features in my sense of the history and visual memory of that period while I was working on the manuscript. 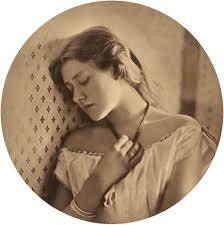 The brief entry may be because, while writing, I chose to make my fictional actress Bellinda Lander as unlike the real Ellen Terry as possible. Terry with her red-gold hair, seems to have been as warm and loveable in private as she was scandalously popular in public, with her three marriages and rumours of numerous affairs, while my dark-haired Lander is definitely not a loveable woman. Besides, by this part in the plot, I had plenty of dramatic deception, untangling and adventure going on backstage for my hero Mouse and his friend Kitty. Maybe that is why the ghost of Terry's wonderful beetle-wing dress just whispers by on the pages? The good news is that while I may have down-played Terry’s inspiring dress, it still exists and can be seen. Back in 2011, after long and expensive renovation and the re-stitching of many beetle-wings, the dress went on display among the collection of theatrical memorabilia at Smallhythe Place in Kent, Ellen Terry’s most favourite home, where she died in 1928. The property is now owned by the National Trust. That dress sounds wonderful. Beetle wings - it sounds like something out of a fantasy novel! How I relate to the idea of NO corset to aid quick changes backstage. Evenings in and out of long frocks with someone tugging them off and on you while the corset needles its way into your flesh... and then back out onto the stage looking composed, or ready to continue. Costumes with no corsets = bliss. What a frock though. Every actress loves a costume that draws the audience's attention, corset or not, and this one certainly does. Me too - and those costumes sound absolutely luscious! Thanks for all your comments. It is a magnificent dress, isn't it? I do agree! It's a mesmerising, almost unbelievable dress, and I don't blame you for nicking it! And Smallhythe Place is a lovely place to visit - great cream teas. Great post.